UNIVERSITY PARK — Brooke Fisher stole the show during Saturday’s Blue-White Game with a thrilling touchdown run before getting mobbed by Penn State players during a jubilant celebration in the end zone. Fisher is a 25-year-old woman from Bald Eagle Area who has Down syndrome, and Penn State helped her enjoy an unforgettable moment at Beaver Stadium. 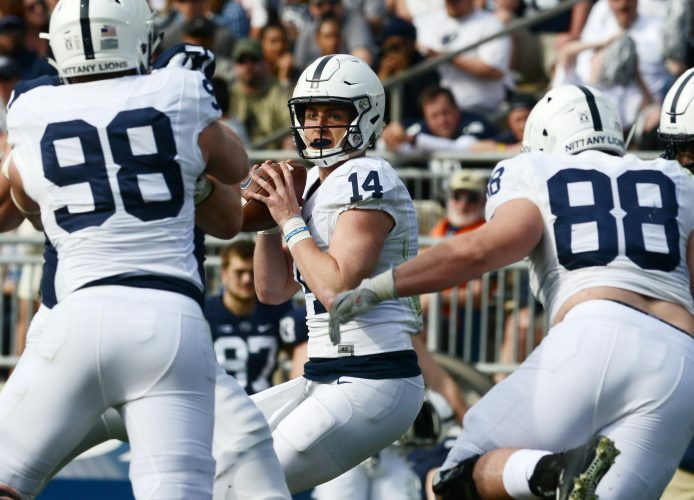 She came onto the field when the Blue offense was at the 22-yard line and gathered in the huddle, then she lined up behind center next to quarterback Trace McSorley and took the snap. Fisher ran around the left side before turning upfield toward the end zone. She eluded a diving tackle attempt from safety Lamont Wade and kept going, and her huge smile showed she was having the time of her life. “It was awesome,” McSorley said. Fisher raced into the end zone and spiked the ball — perhaps a yard early, but who’s counting — and scored the most memorable Penn State touchdown of the afternoon before 71,000 cheering fans. McSorley summed it up best describing the emotions he saw from Fisher. “Her face in the huddle, we got in there, told her the play, what was going to happen, and she goes, ‘That’s something I can do! I can do that!’ She was pumped up,” McSorley said. A lot of college football teams have choreographed similar touchdown runs with fans in recent years, and Penn State pulled off its version very well. “On a day like today, where we can take 10 minutes to do something special for a young woman like Brooke, who is awesome, that’s what it is all about,” coach James Franklin said. “That’s the one thing when you have a child that’s born with a disability, you wonder what kind of moments they’re going to have,” Margie Fisher said. “They can’t always create them, so it’s when teams like that give an opportunity, they create those moments for our kids, and we as parents really appreciate it more than we can say.